Whether you're making a quick mid-week breakfast, a lazy Sunday brunch, or perhaps a small snack to keep you going until the next meal, toast is an essential staple dish in any household. So, it's vital that your toaster is able to withstand your every day demands - and our Kenwood toasters are certainly up to the job. 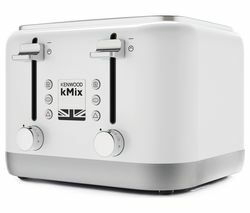 Our range of Kenwood toasters includes the Kenwood kMix 0WTTM020S1 2-Slice toaster. This incredibly functional toaster offers all of the basic features you would expect from a toaster, along with some additional, innovative components. 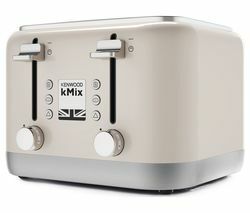 With its unique Peek and View function, for example, this forward-thinking appliance allows you to check on your bread whilst it's toasting, so gone are the days of your toast being too pale or burnt. Other features include defrost, reheat, and cancel settings for optimum convenience, as well as a bun warmer for warming up pastries and other tasty treats. With a high-lift eject facility, you won't have to worry about burning your fingers whilst retrieving your toast, crumpets, or muffins from the toasters. And, with an easy to remove bread crumb tray, you'll find it that little bit easier to keep your kitchen clean, tidy, and hygienic. Of course, your Kenwood toaster should not only be functional, it should also be sleek, stylish, and able to fit seamlessly in to the design of your kitchen. With their classic designs and sleek, contemporary finishes, you can rest assured that these Kenwood toasters will look perfectly at home on your kitchen worktops, whatever your signature interior style. Can't find what you're looking for? Why not explore our extensive range of toasters, including high performance, high value Dualit toasters, Bosch toasters, Swan toasters, Breville toasters, and Delonghi toasters. We also supply a huge selection of other small kitchen accessories such as Sandwich toasters and Grills, which are perfectly equipped to meet all of your toasting needs.